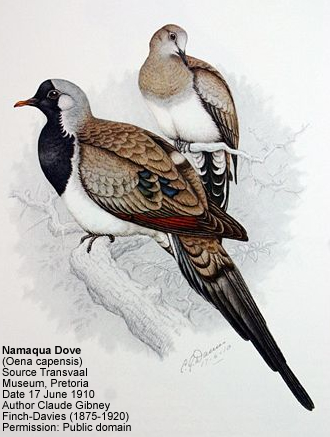 The Namaqua Dove (Oena capensis) is a pigeon which is is the only species in the genus Oena. This dove is a widespread resident breeding bird in Africa south of the Sahara Desert and Madagascar. Its range also extends into the Arabian peninsula and southern Israel and Jordan. This species is found in near desert with acacia and bushes. It builds a stick nest in a bush, and lays two white eggs, which are incubated by the female for 16 days. Its flight is fast with clipped beats and it tends to stay quite low. Namaqua Dove is a tiny House Sparrow-sized pigeon, typically 22cm in length with a 28-33cm wingspan, and weighing 40g. It has a very long black tapered tail, and the size and shape have led to comparison with the Budgerigar. The plumage is mostly grey apart from a white belly, and chestnut primary feathers which are visible in flight. The adult male has a black face, throat and breast, and a yellow and red bill. The adult female Namaqua Dove lacks the black and has a red-based grey bill. Young birds are dark blotched on the wings and shoulders, and otherwise resemble the females. The song is a quiet, short, double hoo, higher on the longer second note kuh-whooo, mournful and frequently repeated. Namaqua Doves are quite terrestrial, and usually forage on open ground and roadsides. The food is almost exclusively minute seeds, such as seeds of grasses, sedges and weeds. They are not very gregarious, and are usually solitary or in pairs, but form larger flocks at waterholes. This dove is rare in North America. Linda Richer - one of a few breeders in Quebec, Canada - has been breeding these beautiful doves since 2004 and describes them as "fantastic birds" that are very quiet and calm, with a soft song. Unlike most dove species, both males and females are beautiful. Even though they are not initially hand tame, they are not nervous birds and can be tamed easily if socialized at a young age. They get their adult plumage between 3 and 4 months.